For over 30 years now, four to six times annually, the vast desert training ranges around Nellis AFB in Nevada, just a stone throw away from “Sin City” Las Vegas, are turned into war zones. 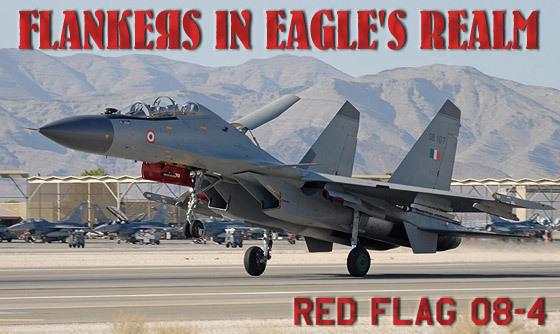 For the US Air Force, Red Flag is their premier exercise to practice Dissimilar Air Combat Training (DACT) on a squadron-wide level, in the closest representation of a full-scale air campaign to be found outside of an actual conflict. 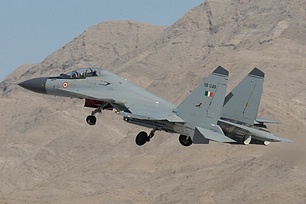 But in August 2008, the icing on their cake was to fly missions with and against Indian Su-30MKI Flankers, one of the best multi-role fighters currently available from the Russian industry. The USAF focus on advanced large-scale training had not always been so high. Red Flag was primary founded as a result of the Air Force’s combat losses over Vietnam, in a time when pilots and commanders were taught that radar and guided missiles would make close-range Air Combat Maneuvers (ACM) obsolete. That obviously was not the case. A study back then had shown that pilots who survived the first 10 combat missions had drastically better odds at living through their next missions. The logical conclusion was to give all USAF Pilots the chance to fly those crucial first ten missions in an “almost real”, but safe combat environment – Red Flag was born. It could be argued that the range in Nevada – an area larger than Switzerland - is among the best instrumented and equipped ACM training locations in the world. Using the Red Flag Measurement and Debriefing System (a highly specialized Hardware and Software package), it becomes possible to digitally monitor and record engagements in real time, visually reconstruct maneuvers of whole “packages” down to every single aircraft and engagement during the debrief, and ultimately integrate all this information with the status and activity of simulated ground targets and ground-based threats. This virtual 100% situational awareness then serves as a valid base for assessment of tactics and “lessons learned”. Red Flag missions are typically realistic engagement scenarios comprised of “Blue Forces” (the students) against “Red Forces”. 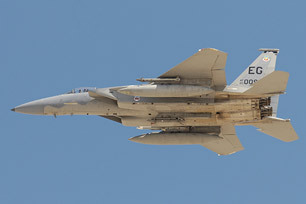 This adversary role at Nellis is primarily flown by the 64th and 65th Aggressor Squadron, using F-16s and F-15s to simulate MiG-29 and Su-27 threats. The Aggressor crews are highly trained in enemy (formerly predominantly Soviet Union) tactical doctrine and use their aircraft as well as sensors within certain restrictions to portray a realistic enemy fighter capability. They are supported by selected other units from the Air Force, Navy and Marine Corps. While the composition of the “Reds” remains largely unchanged, the Blue Forces vary each exercise and are comprised from all branches of the US Military and participating allied Air Forces – which are eager to benefit from the unparalleled training value of Red Flag. For this year’s fourth run, the most highly anticipated guests certainly came in Russian aircraft. The Indian Air Force (IAF) had brought eight Su-30MKI Flankers, two IL-78MKI tankers and one IL-76MD transport. Having arrived at Mountain Home AFB in Idaho on July 17th, the fighter pilots of No. 20 “Lighting” Squadron from Pune underwent a three-week familiarization with the local environment and training rules, flying small Air-to-Air and Air-to-Ground missions against 18th Aggressor Squadron, which came down from Eilson AFB in Alaska, and the resident 366th Fighter Wing. They also got a chance to exchange rides with their American colleagues, a thrilling opportunity especially for the local pilots. Moving to Nellis on August 8th, it became clear that the Indians suffered notable handicaps, some of them self-imposed. Contrary to last summer’s training at RAF Waddington in the UK, their NIIPBars radars were reportedly emitting this time, but only in a training mode that operates with reduced performance and features. Russian and Indian Officials were concerned not to reveal too many details of this sophisticated sensor (variants of which are to be used in the Su-35 and PAK-FA). The same holds true for the capabilities of the AA-12 Adder Air-to-Air Missile (R-77 “Amraamski”) which was not to be simulated in the exercises, instead virtual A-10 “Archers” (R-73) had to be fired. Given that Red Flag is large enough in scale for Beyond-Visual-Range scenarios to come into play, these two systems would have made a considerable impact. Opting to not use their most potent Air-to-Air equipment, the Indians instead performed mainly in the ground attack role, using their Litening III pods for precision strikes. Yet matters turned even more lopsided since they also did not use countermeasures against simulated SAM launches, and abstained from using the Common Data Link, relying instead on normal voice communication to relay targets. Despite those limitations, the training gained was considered highly valuable by all involved. Other participating Air Forces were not as heavily restricted – the French Armée de l’Air had sent four twin-seat Rafales from Fighter Squadron 1/7 “Provence” to Nellis, complete with 20 air crews, 60 maintenance personnel and a C-135F/R tanker/transport. For those aircraft it was also the first deployment to the continental US, starting off with an introduction at Luke AFB in Arizona as guests of the 56th Fighter Wing before also joining the larger “war” in Nevada on August 8th. To give an estimate of otherwise mostly unpublished results, flying against F-18E Super Hornets in a match-up towards the end, the Rafales scored 6:2, certainly outstanding results for the aircraft and crews. 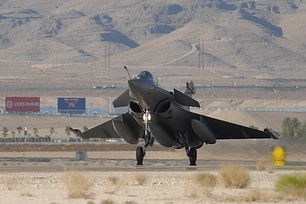 In the air-to-ground role, the Rafales excelled at delivering their GPS guided AASM payload (6 rocket-boosted glide bombs per aircraft), enjoying relative immunity to ground based defenses through their “Spectra” electronic warfare suite, for which the rich threat environment at Nellis proved as a perfect test. The French crews are very much looking forward to their “Damocles” laser target designator pods scheduled to arrive next year, but are also wishing for a helmet-mounted targeting sight similar in capabilities to what the Indian and US crews already brought into the fight. Their IRST “OSF” sensor proved also excellent as a passive, undetectable advantage. 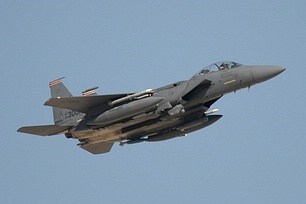 The Republic of Korea Air Force (ROKAF) attended for the first time with six F-15K, which came directly from the Boeing factory in St. Louis to Red Flag, before leaving for South Korea. Together with local units, all three foreign nations flew Blue Force missions for the entire duration of the exercise, which ended on August 22nd. Interestingly enough, while F-22 Raptors had participated at earlier “Flags” with a very impressive kill ratio, for this occasion they did not enter the fight at all. While busy deployment schedules are officially cited as reason, some analysts suspect that either the Air Force did not want to risk bad publicity by having one of their premium fighters “shot down” by legacy aircraft - in a time when congressional lobbying continues to fund more F-22s - or that they simple wanted to keep the exact performance of the aircraft’s systems unknown to foreign participants, just as the Indians and French certainly did not reveal all their system’s capabilities. While official engagement results are never published by the Air Force, it is safe to say that Red Flag 08-4 was a great opportunity for all involved crews to get a feeling for “real combat conditions” and also to improve cooperation with each other – for the Indian crews, the biggest hurdle was to perform in a totally network-integrated, highly AWACS-guided force structure previously unfamiliar to them. Sadly, sometimes this valuable training comes at a high price. 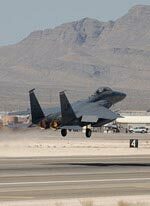 A week before the Indians and French visitors arrived at Nellis, the Commander of the 65th Aggressors, Lt. Col Thomas Bouley, died in a crash of his F-15D. He had over 4000 flight hours in the Eagle. His experience will be sorely missed in the Squadron and future Red Flags. The second pilot (on exchange from the RAF) could safely eject and will hopefully be able to reveal what happened. Thanks go out to the hard working PAO crews at Nellis for organizing the visit and tour, but a word of advice may be allowed: If the aim is to support journalists, not “tail spotters”, then briefings and interviews should also be provided, not just - arguable excellent – photo opportunities without factual information. A little more careful selection of the attending persons (getting rid of mere hobbyists passing themselves off as media) and thus more time to attend individual needs and arrangements would go a long way in allowing aviation journalists to successfully finish their magazine assignments.